… is a family owned business which got its start back in 1983 as Fox Valley Portables. After working for their father Marv for a few years, Marv retired and brothers’ Brian and Bruce Van Eperen took ownership of the company and created AAA Sanitation, Inc. Questions or Quotes? Contact Us. A representative of AAA Sanitation, Inc. will contact you within 24 hours during our normal work hours M-F 7:30am to 3:30pm – Thank You! 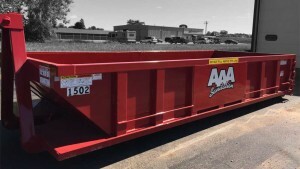 Choose from a 15, 20, 30, or 40 yard dumpster for your project needs. Conventional septic tanks, mound systems, holding tanks, barn pits, grease traps, floor drains, etc. AAA Sanitation stays in compliance with all DNR, federal and state regulations. We’ll continue to work hard to provide outstanding service as well as being your most trusted sanitation professionals. © Copyright 2019 AAA Sanitation, 1334 Mid Valley Drive, De Pere, WI 54115.